February 2019 - Florida Audio Expo 2019 show wrapup: Listeners were so impressed they left shaking their heads at such a huge sound coming from the small Brios. February 2019 - The NOLA BOXER 3 won a 2019 Editors Choice Award from The Absolute Sound magazine. October 2018 - RMAF 2018 Show Wrapup: "The only room with the sound of 'live music'." October 5-7, 2018 - NOLA will demonstrate the production version of the new Metro Grand Reference Gold 2 at RMAF 2018 Oct 5-7. Sure to be a memorable musical experience. See you there. March 2018 - NOLA is proud to introduce the new premium version Contender S3 at Axpona, April 13-15th. Hope to see you there. November 2017 - Part Time Audiophile named the Boxer S2 as one of their RMAF Best in Show loudspeakers! October 6-8, 2017 - NOLA will attend the 2017 Rocky Mountain Audiofest from October 6-8. 2017. We will demonstrate the premium Boxer S 2 stand mounted loudspeakers for the first time. Hope to see you there. September 2017 - French Audiophile-Magazine prints rave review of Metro Grand Reference Gold 2. June 2017 - Nola will exhibit the new Metro Grand Reference Gold 2 loudspeaker at the LAAS 2017 show from June 2 to June 4. All are welcome! February 2017 - Micro Grand Reference Gold wins stand-mounted speaker award from the very select AUDIO NIRVANA magazine. It was rated one of the best stand mounted speakers regardless of price by Joel Chevassus. February 2017 - NOLA BOXER 2 wins 2017 Editors Choice Award from The Absolute Sound magazine. February 2016 - The Absolute Sound magazine has bestowed a 2016 Editor's Choice Award on the Boxer 2. They wrote: "The Boxer is an unassuming, 2-way, bass-reflex compact with a sound that's unerringly musical - a canny balance of warmth and detail. Images are vivid, and transient reflexes quick. This is not a shy, recessed presentation, nor is the treble brittle or fatiguing, Excepr for the slightest presence-range dip, there's substance to every octave, with very little dynamic compression. -NG, 203"
January 2016 - The Brio Trio was awarded a Best Sound award at CES 2016 by AV Showrooms. January 2016 - The Boxer 2 earns a "rave review" and a Best Buy Award from Mono and Stereo Magazine. January 6-9, 2016 - NOLA will show the Metro Grand Reference Gold at the 2016 CES Show in Las Vegas. In addition we will display the new unique 3-piece open baffle BRIO TRIO system. We will be in our suite, Venetian 30-101 from Jan 6 to Jan 9. All are welcome. See you there. October 2-4, 2015 - At the Rocky Mountain Audio Fest for 2015, NOLA will introduce the new KO 2. We can honestly say that KO 2 expands upon the original's virtues in every way and KO 2's performance may redefine what is possible at this price point. You are welcome to bring one of your standard CDs to check them out. See you there. June 2015 - The French magazine Haute Fidelite has just published a rave review of the Metro Grand Reference Gold (Francais). NOLA is distributed in France by TECSART, Armando.Fontana@tecsart.com. May 8-10, 2015 - We will exhibit at the upcoming Vancouver Audio Show in conjunction with our dealer Pat's Audio Art. We will feature the new NOLA Studio Grand Reference Gold loudspeaker. The show runs from May 8th to 10th at the Hilton Vancouver Metrotown hotel. All are welcome. Hope to see you there. January 2015 - NOLA debuts the amazing Studio Grand Reference Gold. 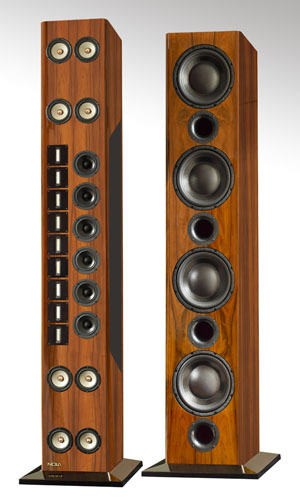 This floor standing entry to the Nola Gold Collection has stunned listeners at both the 2014 Rocky Mountain Audiofest and the 2015 Consumer Electronics show. Ask your local dealer. January 6-9, 2015 - At CES 2015, NOLA will present the Concert Grand Reference Gold. New upgrades have made the best even better. Visit us in Venetian Suite 30-101, January 6-9, 2015. December 2014 - HiFi Stars reviewed the NOLA Boxer II. The reviewer concludes: The smallest Nola Boxer has conquered my listening room with an impressive performance. Everything seems balanced and shines in the most beautiful timbres, without being (designed) too much (or too less) somewhere in the spectrum. Such a matter of course, with the reproduction of complex musical passages, is usually found only in much higher priced speakers. And for compact speakers, their high efficiency allows even the use of less powerful amplifiers, regardless of transistor or tube. My tip: Whoever has audiophile demands and wants to fill a small to medium sized room, should definitely listen to this loudspeaker. If I was looking for a speaker in this category, I would choose the Nola Boxer Mk II without hesitation as high priority in my shortlist. Is there a bigger compliment...?"